You don’t like things fancy, just fun. And if your friends can come along, you’re happy. With larger urethane wheels and a wider deck, the Lil’ Kick Scooter is designed for stability, and made especially for little riders learning to balance and steer. So put on your helmet, grab your friends, and go kick it together. The extra-wide, slip-resistant deck keeps tots on their little toes. Great for your young rider looking to learn to ride with the big kids. Large wheels add to the balanced ride. The Lil’ Kick’s stand-alone, three-wheel design makes for a more stable ride that helps young riders build coordination. Grandkids LOVE it!Got this for my younger grandkids who want to scoot around with the bigger kids. They LOVE it! Great for little kids!I bought this scooter for my 3 year old niece and she LOVES it...and she looks so cute riding it! This was her first scooter, and it's quickly become her favorite toy. 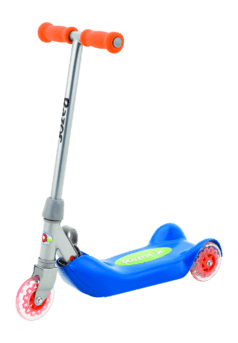 If you're looking for a fun, safe, scooter for a small child, I'd highly recommend this one!